A domestic surveillance program called Quiet Skies—which is operated by the Transportation Security Administration, or TSA, and was revealed Saturday in a "blockbuster" Boston Globe exposé—is provoking strong criticism, with the ACLU asserting that "such surveillance not only makes no sense, it's a waste of taxpayer money and raises constitutional concerns." "Already under Quiet Skies, thousands of unsuspecting Americans have been subjected to targeted airport and inflight surveillance," the Globe reports, citing documents and people within the department. The program, which launched in March, uses armed federal air marshals to covertly monitor how U.S. citizens behave on commercial domestic flights. The undercover marshals are required to take "notes on whether travelers use a phone, go to the bathroom, chat with others, or change clothes." In their reports to TSA, marshals may "document whether passengers fidget, use a computer, have a 'jump' in their Adam's apple or a 'cold penetrating stare,' among other behaviors," according to the Globe's review of agency records. Although TSA declined to even confirm the existence of Quiet Skies—a spokesman claimed disclosing such information "would make passengers less safe"—in addition obtaining to internal records, the Globe spoke with marshals who "say the program has them tasked with shadowing travelers who appear to pose no real threat—a businesswoman who happened to have traveled through a Mideast hot spot, in one case; a Southwest Airlines flight attendant, in another; a fellow federal law enforcement officer, in a third." "Quiet Skies represents a major departure for TSA," the newspaper notes. 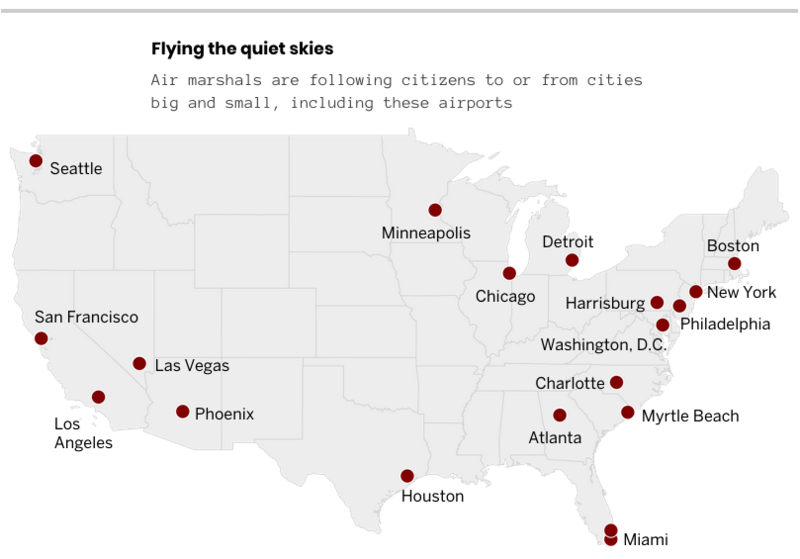 "Since the Sept. 11 attacks, the agency has traditionally placed armed air marshals on routes it considered potentially higher risk, or on flights with a passenger on a terrorist watch list. Deploying air marshals to gather intelligence on civilians not on a terrorist watch list is a new assignment, one that some air marshals say goes beyond the mandate of the U.S. Federal Air Marshal Service. Some also worry that such domestic surveillance might be illegal." "All U.S. citizens who enter the country are automatically screened for inclusion in Quiet Skies—their travel patterns and affiliations are checked and their names run against a terrorist watch list and other databases," the Globe reports. Hugh Handeyside, a senior staff attorney with the ACLU's National Security Project, said that "these revelations raise profound concerns about whether TSA is conducting pervasive surveillance of travelers without any suspicion of actual wrongdoing." "If TSA is using proxies for race or religion to single out travelers for surveillance, that could violate the travelers' constitutional rights," he explained. "These concerns are all the more acute because of TSA's track record of using unreliable and unscientific techniques to screen and monitor travelers who have done nothing wrong." Readers, too, raised civil rights concerns—one blogger denounced it as "a creepy violation of constitutional rights," while others called it "disquieting" and "disturbing."